In 1980, only five years after Vietnam War ended, I managed to make my way from Laos, swimming across the mighty Mekong through brainwashed Pathet Lao soldiers bullets, ending in the overcrowded Thai jail for many months, to end up in Brussels where I landed. Before the once in the lifetime adventure, I had already finished third year of secondary school in Lao. Due to administration error, my birthday was pushed back 3 years on the traveling document and had to start my primary school from year 3 once again. Studying in the developed world was not the way I imagined back in my young age dream. I imagined creativity, fun, enjoyable, friendly environment, productive, cares for the unfortunate. People are not being educated; they're being tested for levels of obedience. 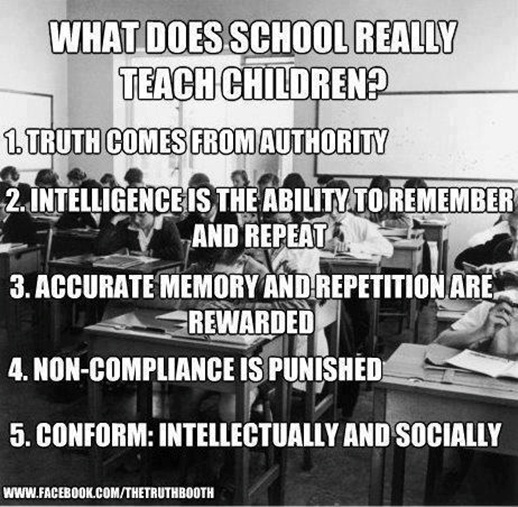 School is about memorizing what you are told short term and repeating it. The bulk of how you are graded is by completing daily work. Obedience is, in fact, workforce's most important quality in a worker bee. When children start going to school, not only they spend most of their day in the classroom, but they start being conditioned to the 8 to 5 schedule which will be the blueprint of their future. Many young college students, hoping to further their education, are deluded into accepting loans that they believe can be payed once studies are completed and have received their degrees. 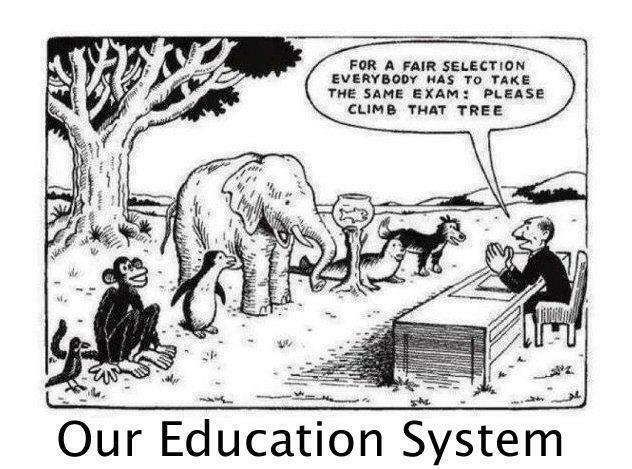 This is how students are molded into an expectation of going through the grades of school, attending college and landing the dream job. But the statistics show that student loan debt money, supplied by private bankers from notes created by top level banksters out of thin air at the first place, has now surpassed credit card debt in the U.S., with many of those loans unable to be paid back, proving this scam is yet another system of debt enslavement set up by the banking elites of the Vatican-Jesuit-Royals and their secret societies and elites who runs the US CORPORATIONS, headquartered in Washington DC independent States in order to shutdown the real physical US economy. Take an example of meat industry, recent reports about how horse meat has been smuggled into certain meat products in England, Sweden, and elsewhere remind me of one of Paris’s unusual features: the numerous butcher shops that sold horse meat. Such a shop usually sported a mounted life-sized horse head (made of metal or wood) above the store entrance to advertise unequivocally that the butcher specialized in the sale of horse flesh. I ate horse meat at a small neighborhood Parisian restaurant a number of times. It was smoothly textured and more gamy than beef. I wasn’t particularly fond of it but it did have the virtue of being affordable. In those post-war days, low-income Parisians were more inclined to eat horses than ride them and that remind me people eating dogs and cats in Laos instead of domesticating them. All the talk today about how undesirable it is to consume horses, dog, cat and insects carries the implication that our immense ingestion of other livestock is perfectly acceptable. We are advised not to eat horses, nor dogs, rabbits, or cats—no matter how close to starvation we might be. But devouring limitless numbers of cattle, pigs, sheep, lambs, chickens, turkeys, and ducks is quite all right. This causes us to overlook the real problem, which is not horse meat, dog or cat meat but meat consumption in general. The world cannot feed itself if it continues to make meat a common staple. Millions upon millions of livestock require vast amounts of freshwater, grain need lots of freshwater too, ultimately far more than the way we are actually managing freshwater. Let's take a figure into account, to produce 1 kg of beef, it needs 15 500 liters of freshwater, that's 15.6 cubic meters and takes a period of over five years to produce it. But the same quantity of nutrients found in 1 kg of meat can be found in vegetable and fruits too. Using less freshwater, less time to produce it, and at the same time, plants generate oxygen compared to animal generating CO2 and deadly bacteria. Aside from the survival problems raised by the consumption of immense quantities of land, water, and grain in producing meat, there is another menacing aspect: all the poisons and torture that happen along the way from the feedlot to the supermarket. For the health of the planet and for our own health and for the sake of the livestock, we should stop eating animals. Rather than calling for more regulation of meat production, we need to move entirely away from meat meals. Originating from the top of the food chain, all animal products menace our health. Pesticides and other toxic run-offs work their way into the food and water consumed by livestock. So with wild and farmed fish, and seafood. Finally, perched at the highest rung of the food chain, we humans feast on the accumulated toxins that concentrate further in our bodies. We makes Medical mafia business booming, think about that, It's a scam, the more you know the more our life is a scam. Many of us are unsettled about eating horses, dogs, cats, rabbits, snakes, monkeys, rodents, alligators and all kind of insects—which other people around the world do eat. Perhaps we should give more attention to the horrid mistreatment of domesticated livestock, the mass produced cruelties of factory farms, the torturous stalls, the joyless overcrowded feedlots, the loads of antibiotic and hormone additives, the frequent sickness and fatal dismemberment, and the terrible toxic accumulations. Hydroponic and global freshwater management system is the only way if we want to feed 7 billion of us, and 3 billion more will join us soon by 2050. Above all we are Humanity, eating plants is more sanity for 21st century Human being. Save your health and your planet. Teach our children to teach their Children. In the age of universal deceit, telling the truth is a revolutionary act.